Demonstrating safety for the application of ever more complex technologies is a formidable task. System engineers often do not have the appropriate training, are unfamiliar with the range of safety approaches, tools and techniques, and their managers do not know when and how these may be applied and appropriately resourced. Aircraft system safety provides a basic skill set for designers, safety practitioners, and their managers by exploring the relationship between safety, legal liability and regulatory requirements. Different approaches to measuring safety are discussed, along with the appropriate safety criteria used in judging acceptability. 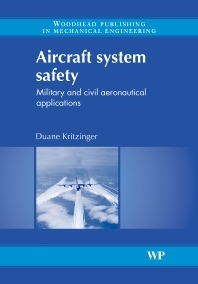 A wealth of ideas, examples, concepts, tools and approaches from diverse sources and industries is used in Aircraft system safety to bring the theory of safety concisely together in a practical and comprehensive reference. Engineering students, designers, safety assessors (and their managers), regulatory authorities (especially military), customers and projects teams should find Aircraft system safety provides an invaluable guide in appreciating the context, value and limitations of the various safety approaches used in cost-effectively accomplishing safety objectives. Safety within the legal framework; The safety concept; Standards and regulations; Risk based approach; Goal based approach; Hazards; The fail safe dimension; The safety assessment; The safety case; Numerical probabilistic approach; Minimum equipment lists; The safety management system; Concluding observations. Very few people in the industry have this kind of overview/supervision on the topic system safety/airworthiness certification. Very well written by the author.